Yesterday I did a video post looking at the ‘magic numbers’ from the mountain stages in the Tour de France, and showed you SRM measurements that show that the top cyclists in the Tour ride the longer mountain passes at around 5.9 to 6.1 W/kg, and that riders in the top 20 are a shade below that, in the range from 5.6 W/kg to 5.8 W/kg, depending on the length of the climb. For shorter climbs, 20 to 30 min, expect 6.4 to 6.5 W/kg from the best. Those numbers have some fascinating physiological implications, but that’s for another post. Today, I’ll look more comprehensively at the power output required in the Tour, not just in the mountains, but start to finish. To do that, we’ll take an outside-in approach – start with the overall, global view, and then get progressively more and more focused on the key segments of the race. That is, after all, where stages are won and lost – the mountain climbs, the five-minute maximum efforts, the attacks and the sprints. So let’s start with a step back, and consider the Tour as a whole. The 2011 Tour takes in 3,430.5 km (or 2,132 miles) over 21 stages. Last year’s race was 3,642 km, and was won in 91 hours, 58 min and 48 seconds. Incidentally, that winning time is not too dissimilar from the very first Tour, back in 1903, which was won in 94 hr 33 min 14 sec. The only exceptions are that the 1903 Tour was ‘only’ 2,428 km long, and was done in only six stages – average length 405 km, and taking on average 16 hours to complete, at a still respectable speed of almost 26 km/hour! That’s especially good when you consider bicycles that weighed about 40 kg (88 pounds)…! 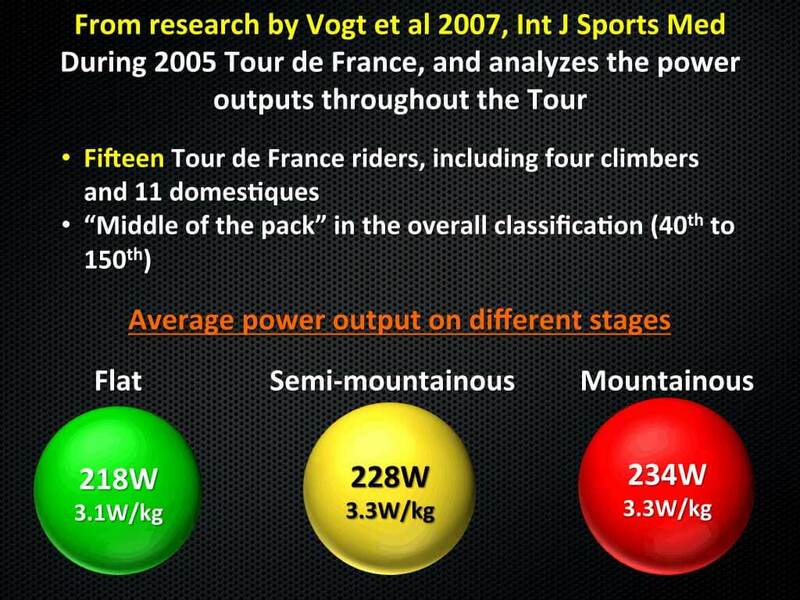 Anyway, back to the modern Tour…in 2005, a group of scientists did some measurements of power output during the Tour (which was 3,698km long), and these are published in a paper by Vogt et al (2007, Int J Sports Med). They looked at 15 cyclists in the race, all of whom were in the ‘mid-pack’ (from 40th to 150th), and we’ll take a look at their results below. So the first, global finding? The average power output over the stages analysed (which included mountain stages and flat stages) of the Tour was approximately 227 W, or 3.2 W/kg. Average heart rate during the race in the 15 cyclists was 136 bpm. At face value, one might view those numbers with some surprise at how relatively low they are (given what you might have been expecting). However, one must bear in mind that for long periods, particularly on the flat stages, the intensity of riding in the middle of the pack is relatively low. That’s because riders find shelter in the peloton, and the drafting effect saves huge energy. 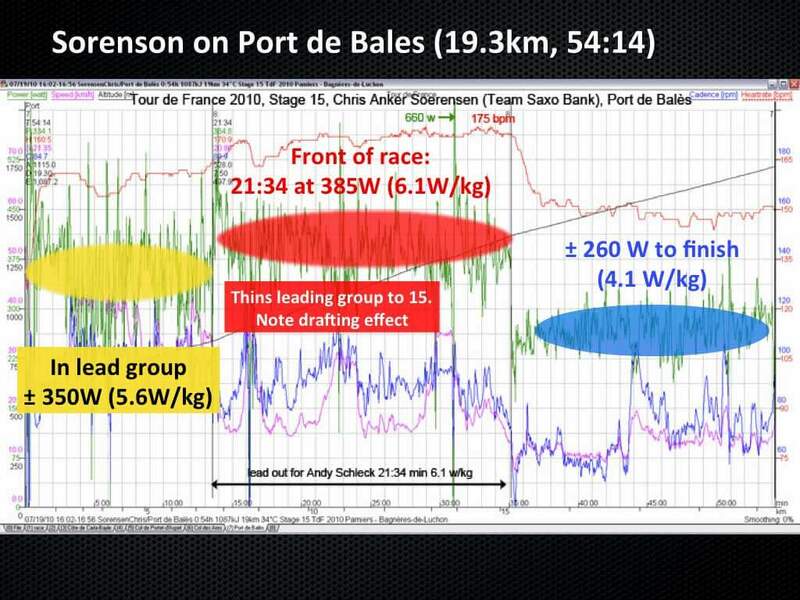 First, the average power output during the stage is “only” 176 W (the green line in the graph). I say that because many of you would be perfectly capable or riding at that intensity for 5 hours if it was required. However, the key point is that there are periods of almost no work, where the power output is down in the 120 W range, and there are periods where it is up above 300 W, most notably at the end, which I’ll get to shortly. Telling is the cadence, shown by the blue line – only 66 rpm average, which shows that Horner was sheltered in the peloton and therefore riding a very efficient day’s racing. Speeds of 40km/h or faster could be maintained at a power output of only 150 W, with a greatly reduced need to even pedal, let alone pedal hard, thanks to the drafting effect! But now look at the final 4km of the race. You’ll recall that this stage ended with a short climb, 3.7km long and the racing was suddenly very intense. Now, you see the real make-up of a Tour rider – Horner had the ability to produce 430 W over those final 3.7km (6.7 W/kg), including periods up above 700W, albeit for a very short time (these are shown on the graph) is what is required to remain in the group. So in other words, it’s all good and well to ride at 200 W for five hours, but that’s not what is needed in the Tour – it’s the hard efforts interspersed with easier, economical riding in the peloton that defines the Tour de France. For example, over the final hour of the stage, Horner averaged 264 W (another rider, Chris Anke Sorensen, averaged 267 W). 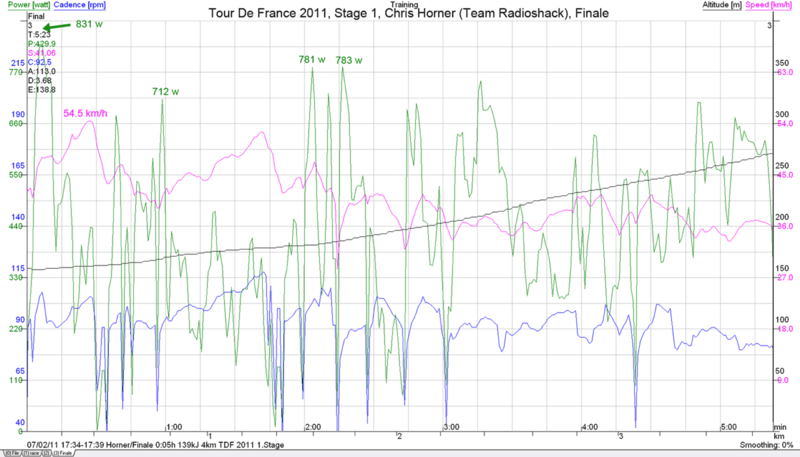 For a 10 min period, also at the end, Horner rode at 364 W (almost 6 W/kg). That puts the 176 W into context. This also brings us to the key difference between the mountains and the flat stages. It turns out that on the flats, because of this peloton drafting effect where the rider can find shelter and conserve energy, the overall power output is lower on flat stages than on mountainous stages. That’s unsurprising, but is shown in the results from the 2005 Tour. So the average power output on the flat stages (the stage definitions are defined in the paper) is 218 W compared to 234 W for the mountain stages (around 3.3 W/kg). No surprise that the mountain stages have a higher power output. But once again, those averages paint an incomplete picture. What you really need to ask is how that power output is achieved? How is effort allocated throughout the stage in order to remain competitive? Bear in mind that these 15 cyclists are not GC contenders, and let’s take a look at a more detailed breakdown of their workrate during the flat and mountain stages. So, on average, you can see that for flat stages, Tour riders will produce a HIGHER power output over shorter durations than in the mountains. Over 15 seconds, for example, cyclists produce 895W on the flat compared to 836W in mountain stages. That’s due to the sprints or attacks, or the very short, very hard ‘pulls’ at the front of the race for team sprinters or leaders. Over 1 minute, the maximal power output achieved is 657 W on the flat stages, compared to 557 W in the mountains. Again, this is because the nature of racing on the flats requires these very intense efforts, either to respond to attacks, to make the attack, or to remain in the group when the hammer is down in the final 10km of the stage. But then, at some point, around 3 to 5 minutes, the situation switches. Now, the maximal power output in the mountains is higher than on the flat roads, which also makes sense – there are fewer situations on the flat stages where riders must go at almost 7 W/kg (490 W in this group) for more than three minutes. In contrast, this kind of effort is more common in mountainous stages – the finish of Stage 1, for example, the 3.7 km climb, would require something in the range of 6.5 W/kg to 7 W/kg, as we saw for Horner above. 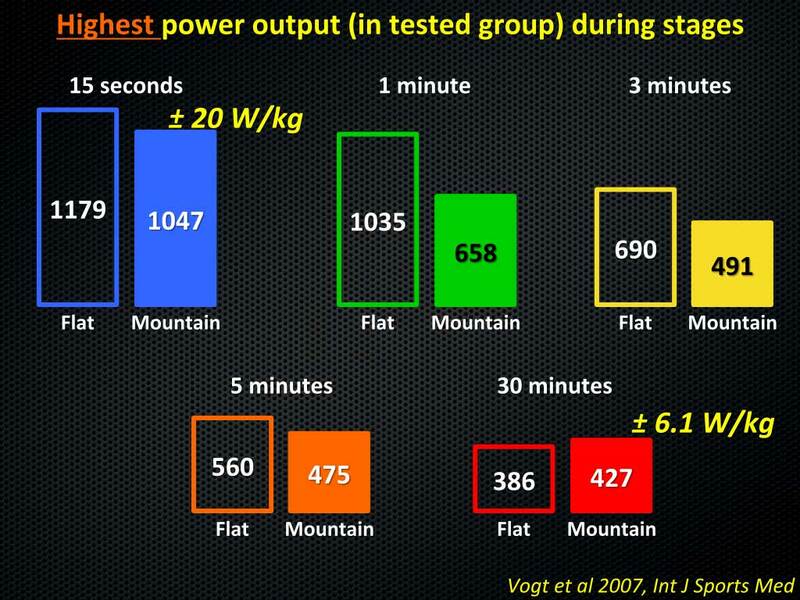 For Phillipe Gilbert, who won that stage out in front (and thus not getting any draft benefit), the power output could easily have been above 7 W/kg for 5 or 6 minutes. So, in the mountains, that kind of effort is much more common – the power outputs required even in the main part of the peloton are significantly higher over these longer durations, and the short, sharp attacks are no longer required. What this tells you about the Tour is that the requirement for sprint efforts – short but very intense – is greater on flat stages, which is not surprising. In the mountains, 30 minutes of sustained higher intensity, but not much above 6 W/kg, is what is required. Remember that the above graph is the average of all 15 cyclists, so it includes men who are not involved at the front of the race on either flat stages or in the mountains. Cyclists who are not GC contenders would have to manage their efforts carefully during the Tour, and so those numbers are lower than what is probably being averaged at the front of the race. To get an idea of the maximal efforts in a Tour, we must take the best of the 15 cyclists and look at their values, which I’ve done in the graph below. So now you can see some significantly higher power outputs – the highest 15 second power output in the race was almost 1200 W, or 20 W/kg, and it came on a flat stage. Unfortunately, we don’t know who this is and when it was achieved, but it’s likely a lead-out or an attempted sprint for stage win. Incidentally, the very best sprinters in the Tour are going to peak at closer to 2,000 W – there are reports of Cavendish at 1,600 W and so 2,000 W for short periods is not inconceivable (a colleague of mine has tested elite BMX riders in Cape Town and measured 2,000W in a guy weighing almost 90kg, so around 20 W/kg is probably close to the ceiling). 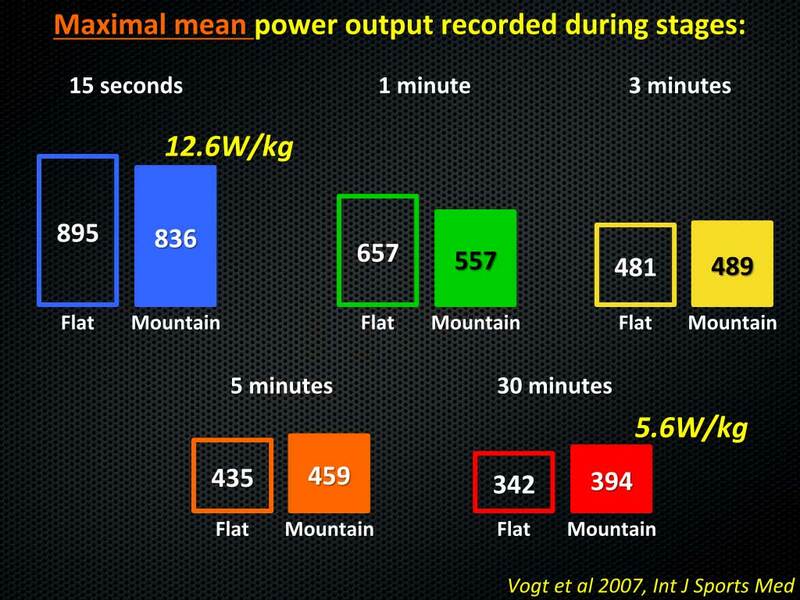 As we increase the distance, you can see that the maximal power output drops, but one cyclist, for example, produced a power output of 690 W for three minutes on a flat stage. Another produced 560 W for five minutes. Again, we don’t know what the situation here was – it may have been in a domestique who had to pull their team leader back into the peloton after a puncture, it may have been team orders to get to the front and chase down a breakaway, and the rider spent three minutes driving as hard as possible at the front. In the mountains, the maximal power output for the shorter durations is not nearly as high as for the flat stages. As mentioned, that’s because those short, hard efforts are rarely required, except for those at the front either racing for yellow or helping team leaders in the final kilometers of mountain-top finishes. However, once again, over 30 minutes, to be competitive, it’s necessary to produce between 5.5 and 6 W/kg. In the 2005 Tour, one cyclist rode at 6.1 W/kg for 30 minutes – this was a climber making his big effort perhaps for a stage win, or to ride with the head of the Tour on a final climb. So overall, the climb took 54:14, and Sorensen averaged 334 W (5.3 W/kg). But again, that’s only a small part of the story. The climb begins with Sorensen in the lead group, riding at 5.6 W/kg for around 12 minutes. Then he takes over at the head of the race. Now, with no shelter from other riders, his power output is much higher to keep the pace hard, and he averages 385 W, or 6.1 W/kg for the next 21:34. That brutal effort is enough to thin that leading group to only 15 men. Eventually Sorensen drops away, and the elite of the Tour begin their attacks (this was the climb where Schleck attacked, then had his chain issues, and Contador went by and gained time). To repeat what I said yesterday, this is a great barometer for what is happening at the front of the Tour – the intensity of Sorensen is slightly higher than those in the group behind would require to stay there, so you can assume around 5.8 W/kg to 6 W/kg for the elite 15 men. They then have an overall drop in power output once Sorensen departs, because a tactical battle with attack and counter-attack begins. The end result is that those elite probably average a shade under 6 W/kg for the entire climb (if I had to guess, based on the comparison and the various calculations for power output, I’d peg the top riders at 5.8 W/kg to 5.9 W/kg for these climbs lasting 45 to 60 minutes). The same was suggested for the Col du Tormalet climb, where Chris Horner conceded only 3% to Schleck and Contador, averaging 5.6W/kg for the climb. Separate calculations for Contador and Schleck, as well as extrapolating based on Horner, suggest about 5.9 W/kg. What all this illustrates though, is the enormous capacity of a Tour rider, even one who is not competing for overall honours. The 176W on stage 1, the 220 W average for flat stages, and even the 234 W average for mountain stages now take on some real meaning, because if you can’t elevate work-rate to around 500W, or even 700W for three minutes, then you can’t perform your role, even as a domestique! Or, if you can’t get close to 5.5 to 6 W/kg for 30 minutes, then you don’t survive in the mountains. So the real test of Tour-caliber is to handle the extremes of intensity – 7 to 8 W/kg for a few minutes, almost 6 W/kg for 30 minutes. And to win the Tour, 6 W/kg for 45 minutes, on every long, finishing climb. That begins next Thursday, of course, with the ride up to Luz Ardiden. And based on yesterday, we can expect some ultra-aggressive racing. Alberto Contador has already conceded time, but his attack yesterday was interesting because it suggests that he feels he has good form. I wrote the other day that one of the big questions for him was whether he’s recovered from a Giro win only a month ago. It would be reasonable for him to stay in the peloton and ‘recover’ over the first ten days of the Tour, and so the fact that he’s involved at the front of a short climb where there’s really little to be gained, suggests that he feels capable of his best over the Tour. It will be interesting to see the power outputs in those final 3km. Based on the similarities between this finish and Stage 1, I would guess that you were seeing around 7 W/kg for the final 5 minutes, and perhaps the attack was up above 8W/kg for 30 seconds. 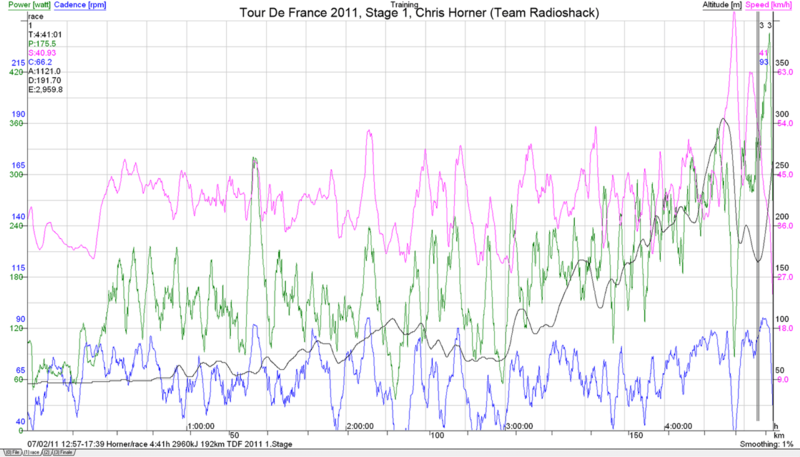 Hopefully, SRM will release Horner’s data later today, and I’ll throw a quick post up on it. Another slight surprise yesterday was the names NOT in the front group of 10. Thor Hushovd was there, but Andy Schleck, Leipheimer, Horner, Wiggins, Kreuzinger – many big names, were not. And sure, Hushovd was a man on a mission to keep his yellow jersey. And yes, it probably wasn’t a ‘priority’ stage given that time losses would be small and thus perhaps not worth that enormous effort, but it was still somewhat surprising to see who didn’t make the group once Contador attacked with about 1km to go. Does it mean those men are not in good shape? The answer is no, not necessarily, and I think part of the reason may be related to what I’ve spoken about in the post – the physiology of being able to produce say 8 to 9 W/kg for three minutes, is quite different to being able to produce 6 W/kg for 30 minutes or longer. So all we can really say is that Contador is in good shape, as is Evans, but their good performances yesterday don’t predict a good climb up Luz Ardiden, and neither do the time gaps for Schleck, Wiggins and co suggest that they’ll struggle in the high mountains. However, it does raise a seed of doubt. It certainly sets the high mountains up nicely. Today is a flat stage – expect the usual early break-away, reeled in by the sprinter’s team, and a bunch sprint. Then Wednesday is what is called a “lumpy” stage, followed by another flat stage, and then a testing stage to Super-Besse on Saturday, where we may see a change in the yellow jersey. If it doesn’t happen then, look for Sunday, where riders will hit five Cat 2 and Cat 3 climbs within about 50km in the middle of the stage. As always, we’ll be following!